There has been a great deal of media attention lately on concussions and serious brain injuries suffered by professional football players, many of whom have endured years of brutal physical contact that may have included constant slaps to the head and bone-crushing tackles or blocks. Baseball catchers also routinely experience blows to the head from foul balls or home plate collisions and some have seen promising careers end prematurely. But did you know that car accidents account for more head injuries than any other event? While sports injuries are responsible for about 20% of traumatic brain injuries (TBI), car accidents cause approximately 28% of such injuries. It is not surprising since there are millions of motor vehicle accidents each year that result in injuries, many of which are head injuries. Many people are not initially aware that they have suffered a concussion, let alone a traumatic brain injury. There are, however, certain signs to be cognizant of following a car accident to see if you did suffer a concussion. In most cases, car accident victims make a complete recovery after a week or so, some concussions can be serious and life threatening. Always seek medical attention if you suffer any of the signs of a concussion. You lost consciousness. This is the most obvious sign since the force involved in the collision was enough to cause you to lose consciousness from striking your head on the windshield, steering wheel, or other object. You might have been out for just a few seconds but in any case, your brain has suffered trauma. Again, be aware that you do not have to lose consciousness to have suffered a concussion. You feel nauseous, dizzy, feel sensitive to light, and may have vomited more than once. This should alert you that you have suffered a car accident concussion though you did not necessarily pass out at any time. You may not recall even hitting your head. You experience confusion and amnesia. You may not realize for several hours, or even a day or more, that you no longer recall certain things or are confused about the date or cannot concentrate on the task at hand. You saw stars or have ringing in your ears. Usually, this follows a blow to the head without and indicates mild trauma. Mood changes. You or someone points out to you that you are more easily angered, are irritable, listless, or appear nervous or anxious for no discernible reason. You may also be depressed. Sleep patterns are disturbed. This could mean you are sleeping more than usual, have problems falling asleep, or are sleeping less than normal. 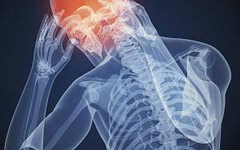 Headaches that worsen or will not go away and problems with balance or blurry vision. In more extreme cases, seizures may occur. A car accident concussion can also result in a traumatic brain injury, a serious intracranial condition that can affect your cognitive abilities leading to a permanent life altering disability. TBI also accounts for one-third of all injury-related deaths in the US. If you or a loved one was involved in a car accident where a concussion or brain injury occurred, consult with a car accident lawyer about your legal options. For some TBI sufferers, they may be able to return to some kind of employment but at a wage that is substantially lower than their regular employment had paid, along with loss of certain benefits. Burns & Jain is a Boston concussion law firm that has been representing victims of car accidents with TBI or other injuries for over 25 years. Being sensitive to the signs of a concussion and to the catastrophic effects a concussive injury can lead to has made Attorney Neil Burns & Roshan Jain sought-after accident lawyers who have obtained millions of dollars in compensation for their clients. Call him today for a free assessment of your car accident case.